Region of sea and mountains, Abruzzo is rich in flavours. Abruzzo boasts three beautiful national parks, a whole host of local products, and a dramatic coastline which has inspired writers, poets and painters alike. Abruzzo is a primarily mountainous region at the very heart of central Italy. Its peaks slope gently down to the east, eventually forming a thin, flat strip before plunging into the Adriatic Sea. The sandy beaches running right along the eastern edge of Abruzzo are a big hit with summer tourists, as are the Apennine Mountains, which make this region the main winter tourism destination in central-southern Italy. With no fewer than three national parks within its borders, the area is home to some charming unspoilt landscapes which form the habitat for animals such as the Apennine wolf and the Marsican bear. Abruzzo has a poor, rural history, but it is packed with flavour. 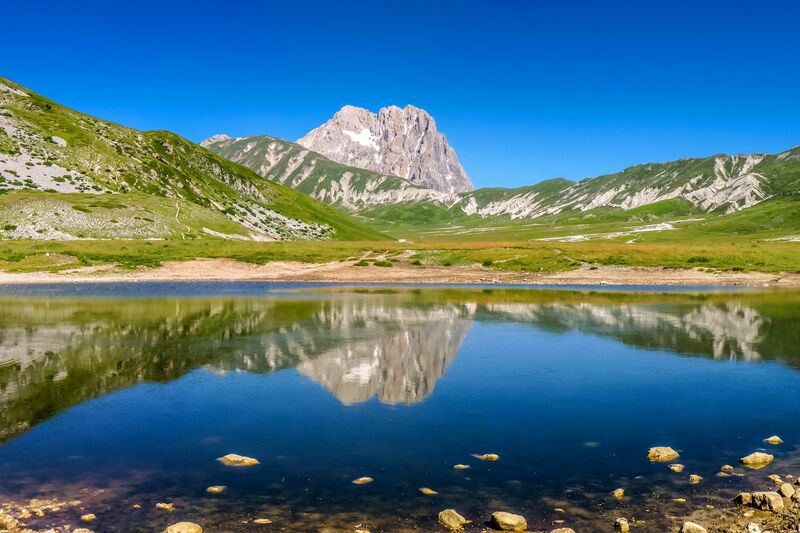 The region's three national parks (the National Park of Abruzzo, Lazio and Molise National Park Majella and the Gran Sasso National Park and Monti della Laga) are a haven for hikers and walkers, as well as other regional parks which together make up 36% of the region's surface area. Within the numerous protected areas, scattered across the Apennine ridges, the fertile hills of the hinterland and along 130km of coastline, you will find more than 75% of all animal and plant species on the European continent. Eco-travellers are also beginning to discover this region's potential. According to the Italian government, Abruzzo has one of the lowest mortality rate for tumors in the country, with lower greenhouse gas emissions per inhabitant, and greater consumption of electricity produced from renewable sources. It is also famous for its high number of small villages, with as many as 21 making it onto the prestigious list of "Most Beautiful Villages in Italy." 'Strong and gentle', as its motto says, Abruzzo is a pleasure to discover on foot with a low carbon footprint. The region is divided into four provinces: L'Aquila, Chieti, Pescara and Teramo, along with 305 municipalities. The region is mainly divided into a coastal part, on the eastern side, and a mountainous area that includes the Gran Sasso d'Italia (2,912m), Majella (2793 m above sea level) and the Sirente-Velino (2487m above sea level), which together make up the three highest peaks in the entire Apennine chain. Abruzzo's capital, L'Aquila, occupies an area of 10,862 km² and has a population of 1,332,689 inhabitants. If you're looking for some summer sun on the beaches of Abruzzo, Pescara is the most populous city in the region and a major seaside resort. If you prefer less crowded beaches and tranquility, try the smaller towns: Montesilvano, Pineto, Roseto degli Abruzzi, Giulianova, Alba Adriatica, Tortoreto, Francavilla al Mare, Ortona, Vasto, Martinsicuro, Silvi Marina and, in general, the whole Costa di Trabocchi. A bonus for families, many of the region's beaches have been awarded the Blue Flag for water quality and services offered, placing Abruzzo behind only Liguria, Tuscany, and Le Marche for number of flags. Abruzzo is also home to a large number of ski resorts. Currently standing at 24, they are scattered across the mountainous inland areas. Some of the most famous resorts include Scanno, Ovindoli, Pescasseroli, Tagliacozzo, Roccaraso, Campo Imperatore, Pescocostanzo and Prati di Tivo. Winter visitors come in large numbers to take part in alpine skiing, snowboarding, skiing kite, alpine skiing, ski touring, cross country skiing and dog sledding. There are even two stationary ice rinks in Roccaraso and Castiglione Messer Marino. The 'incendio delle farchie' (huge bundles of reeds which are set on fire in Fara Filiorum Petri, near Chieti) on 16 January. The celebration, which takes place every year in the main square by the village church, in front of the statue of St. Anthony, is a religious and popular occasion. In honour of San Domenico Abate, in Cocullo, we celebrate the 'Festa dei Serpari' (Feast of the Snakes), for which you'll need all your courage. In the days prior to the first Sunday in May, the boys of the village hunt snakes, and remove their teeth. On the day of the festival, the harmless snakes are used as bracelets and necklaces. The 'Festa della Madonna dei Turchi' (Feast of Our Lady of the Turks) is a commemoration of the raids of the Saracens on the Abruzzo coast. The historical festival takes place every August, mainly in Tollo, in the province of Chieti. From 8 to 14 August, discover scamorza and saffron at the Festival of Ciboturismo Rivisandoli. Scrippelle are very fine omelettes, similar to crêpes. The Abruzzese people use them as a base for various delicious local recipes, such as 'Scripelle 'mbusse' (meaning 'soaked'), where they are rolled up and cut into slices before being covered in beef stock. In the preparation of 'timballo alla teramana' (timbale of crêpes), meanwhile, they are used as a substitute for puff pastry. Abruzzo is a mountainous region which has been heavily involved in sheep breeding for centuries. With this in mind, meat, and particularly lamb, naturally features heavily in the local cuisine. 'Mazzarelle' are also found in the surrounding regions and consist of flavoured lamb sweetbreads which are then braised - a typical meal enjoyed by shepherds. The best things you can buy in the Abruzzo region are undoubtedly local goods, with many agricultural businesses, shoe manufacturers and ceramic producers in the area, it's perfectly easy to find all your souvenirs. Abruzzo crafts have become over the years one of the region's most prosperous sectors. Abruzzo is one of the few Italian regions where tradition has been preserved and still produces products such as ceramics, iron, gold, lace and fabrics, copper, stone, tools music, wood and wool. As for ceramics, the largest production and processing centre is Castelli, which over the years has become one of the most important centers in Italy for its craft. For gold and silver, you'll find fantastic work in Pescocostanzo, Scanno, Guardiagrele and Orsogna. Guadiagrele is also an important center for copper and iron. Salle is a great centre for musical instruments, while stone work is concentrated in Lettomanoppello, Pretoro, Pennapiedimonte and Pacentro. Leather items, most especially saddles, are made in L'Aquila and enjoy worldwide fame, because they are used by riding enthusiasts throughout Europe.